31 Days to a Clean House! As a crafter, I'd rather crochet or sew something than do housework or cook, but it has to get done. So I just do it. 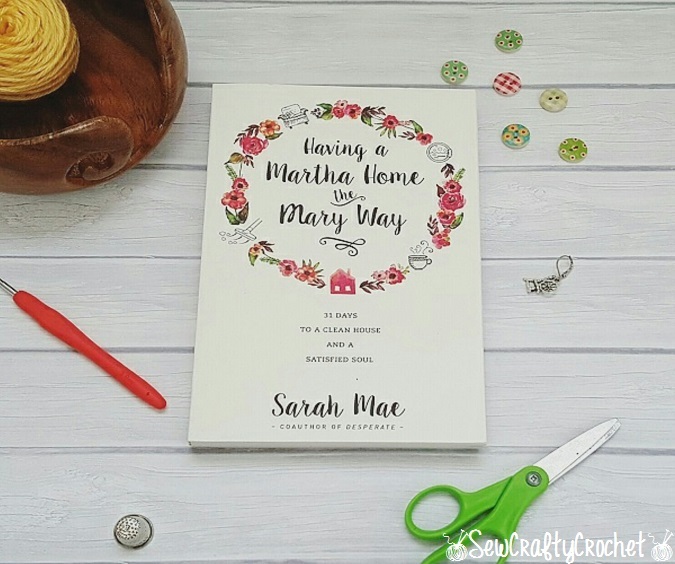 However, if you're like many who absolutely dread cleaning and/or don't know where to start, then Sarah Mae's Having a Martha Home the Mary Way is a great read for you! In this book, Sarah Mae provides tips for cleaning, tips for getting kids to help with the cleaning, tips for organizing, and more. She's created a set of challenges called the Martha and Mary challenges. The Martha challenges are for those who aren't natural cleaners and get overwhelmed by housework. These Martha challenges breakdown cleaning tasks into manageable steps, which are spread out over a month. The Mary challenges encourage you to rest, read Bible verses, fill your heart with God's peace, and ponder aspects of your life. Sarah Mae also encourages us to purge our homes because a clear space equals a clear mind. The reduction of clutter is bliss! The less you have to clean, the less overwhelmed you'll feel. Although I am a natural cleaner, I did learn a lot from this book. I learned that I have LBS, Laundry Basket Syndrome. Like many, I hate folding and putting away laundry, especially now that we live in a two story home. To solve that issue, Sarah Mae suggest doing one load a day. I'm going to give it a try. Another valuable tidbit I picked up is The Six List. Each night, you make a list of the six most important things you need to get done the next day. Then the next day, you complete the list as time permits. Sarah Mae also suggests creating a workable schedule, which is something I've been meaning to do for a while. With this schedule, Sarah does say to make time for hobbies (yay!). In addition to cleaning and organization tips, Sarah Mae also gives decorating tips and tips for making a welcoming home, which include not having plastic coverings on your furniture (do people still do that? ), having throw pillows and blankets, and always have coffee or tea made. So if you need tips on making cleaning and organizing easier, then Having a Martha Home the Mary Way is a great read that I highly recommend. *I received this book from the publisher and the author in exchange for an honest review.